PARSIPPANY, N.J.--(BUSINESS WIRE)--Jul. 29, 2014-- B&G Foods is pleased to announce the release of a Pirate’s Booty® limited-edition, themed multipack featuring Marvel’s Avengers characters, which is sure to make Mom a snack time hero! The collaboration also includes a free Marvel’s Avengers digital comic featuring the Pirate’s Booty Pirate. Consumers will get to see the Pirate team up with the Avengers in a Marvel-created adventure. 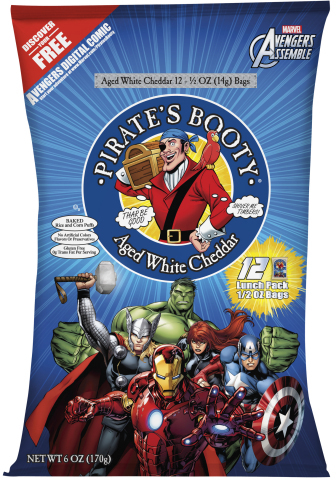 The limited-edition Marvel’s Avengers themed Pirate’s Booty comes in 12 packs of half-ounce Pirate’s Booty Aged White Cheddar – Pirate’s Booty’s best-selling product. The lunch packs are sure to be a hit at school and for refueling your little Super Hero on-the-go. Marvel artists designed a custom digital comic featuring Avengers Super Heroes, including the Hulk, Thor, Captain America, Black Widow, and Iron Man, along with the Pirate’s Booty Pirate. Pick up a limited-edition Marvel’s Avengers themed Pirate’s Booty multipack for more details on the digital comic download. Pirate’s Booty Aged White Cheddar is a deliciously baked snack made from puffed rice corn and blended with real aged white cheddar cheese. Pirate’s Booty is made without artificial colors, flavors or preservatives. Pirate’s Booty has half the fat and fewer calories than regular fried potato chips, so it is a snack that kids and parents agree on. Additionally, it is gluten, peanut and tree nut free and has zero grams of trans fat per serving. The limited-edition Marvel’s Avengers themed 12 packs of half-ounce Pirate’s Booty are available now at retailers nationwide. For more information and a store locator, please visit www.piratebrands.com. Pirate Brands has been creating deliciously baked snack treasures since 1987. Pirate Brands was founded on the belief that you shouldn’t have to “snackrifice” taste and fun for products made with goodness. Pirate Brands’ snacks, which include Pirate’s Booty, Smart Puffs and Original Tings, are free from fryers and ingredients you can’t pronounce, Arrr. For more information, please visit www.piratebrands.com. B&G Foods, Inc. (NYSE:BGS) and its subsidiaries manufacture, sell and distribute a diversified portfolio of high-quality, branded shelf-stable foods across the United States, Canada and Puerto Rico. Based in Parsippany, New Jersey, B&G Foods’ products are marketed under many recognized brands, including Ac’cent, B&G, B&M, Baker’s Joy, Bear Creek Country Kitchens, Brer Rabbit, Canoleo, Cary’s, Cream of Rice, Cream of Wheat, Devonsheer, Don Pepino, Emeril’s, Grandma’s Molasses, JJ Flats, Joan of Arc, Las Palmas, MacDonald’s, Maple Grove Farms, Molly McButter, Mrs. Dash, New York Flatbreads, New York Style, Old London, Original Tings, Ortega, Pirate’s Booty, Polaner, Red Devil, Regina, Rickland Orchards, Sa-són, Sclafani, Smart Puffs, Spring Tree, Sugar Twin, Trappey’s, TrueNorth, Underwood, Vermont Maid and Wright’s. B&G Foods also sells and distributes two branded household products, Static Guard and Kleen Guard. For more information, please visit www.bgfoods.com.